This page is a set of external resources that are extremely valuable for the implementation of the Next Generation Science Standards. Rather than attempting an exhaustive list, this is meant to be a curated list of my "go-to" resources. 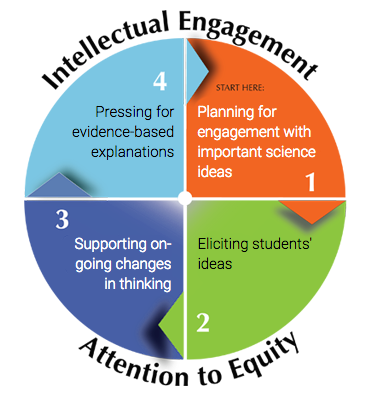 Across the country, districts, schools, and teachers are working on implementing a new vision for science classrooms based on the Framework for K-12 Science and NGSS: classrooms in which teachers support students in science and engineering practices to build and use science ideas to explain real phenomena and solve real problems. A core challenge is the lack of curriculum materials that reflect the dramatic changes in this vision. Traditional textbooks, lesson plans, and units are not up to the challenge. Districts, schools, and teachers are finding they need to find, adapt, or create new curriculum materials to support this 3D approach to science learning. To help meet this challenge, the Next Generation Science Storylines project is dedicated to providing tools that support teachers in developing, adapting, and teaching with strongly aligned NGSS materials in classrooms around the country. What is Ambitious Science Teaching? Great teaching can be learned. This web site provides a vision of ambitious science instruction for elementary, middle school and high school classrooms. Ambitious teaching deliberately aims to support students of all backgrounds to deeply understand science ideas, participate in the activities of the discipline, and solve authentic problems. The STEM Teaching Tools site has tools that can help you teach science, technology, engineering and math (STEM). We are currently focused on supporting the teaching of the Next Generation Science Standards (NGSS). Each tool is focused on a specific issue and leverages the best knowledge from research and practice. Under the News section, you can learn a bit more about how you might use them. This article provides background on this effort. The Research + Practice Collaboratory creates new contexts, partnerships, and resources to support transformational change in STEM. The communities of research and practice have distinct cultural norms, languages, and routines that can get in the way of productive communication. The Research + Practice Collaboratory is experimenting with ways to support mutual cultural exchange between these communities, in order to produce new insights and strategies for tackling pressing problems in STEM education.